HIS GORGEOUS GARB ATTRACTS MUCH ATTENTION IN THE LOBBY AT THE RENNERT — HE WHISTLES AND INDULGES IN EAST INDIAN WIT — HE COMES TO BALTIMORE ON A TOUR OF THE COUNTRY AND WILL SPEAK AT THE LYCEUM TOMORROW NIGHT. 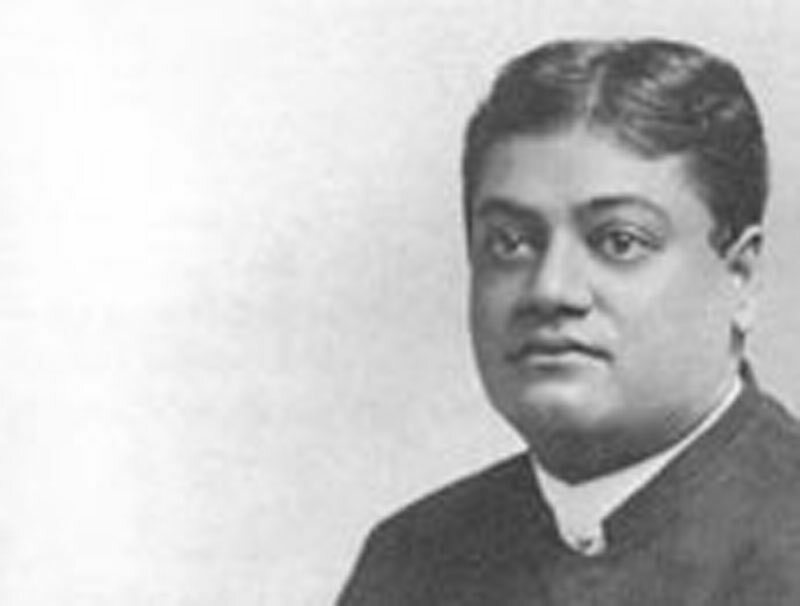 Swami Vivekananda, High Priest of the Hindoos, walked into the lobby of the Hotel Rennert this forenoon attired in a flaming red cloak and a gaudy yellow turban that made him the centre of all eyes. . . .
Swami Vivekananda has the sense of humor about him. He was talking this morning about the Food Show, which he intends to visit. He says he doesn't know much about food except to swallow it, and that is a very representative specimen of the wit of Ormus (Hormuz, or Ormuz, an ancient Iranian town.) and of Ind. The High Priest can whistle and has enough music in his soul to start the tunes in class-meeting if he were Methodist instead of Hindoo. He whistled a couple of strains in his room this morning for a reporter of The News. It was not "Daisy Bell" nor yet "Sweet Marie," and must have been some sort of a heathen Hindoo jingle. . . .
Swami is traveling around the country, as he says, lecturing and studying American institutions, but he seems not to have got much into the pith of American sociology, for he knows nothing of such questions as European immigration, divorce, the race problem, etc., which are worrying the economists of the land. He is, however, posted on Oriental immigration, and says the United States has no right to bar out the Chinese. He says the law of love must prevail and force must yield. He predicts the downfall of any nation that uses force. He says also that the United States should open her doors to the world. He believes the Southern part of the continent should be filled with Hindoos and Chinese. our law does not allow it. Our women are more limited in their sphere than the women of America. Some of them are as highly educated. They are entering the medical profession to some extent now. I see no reason why American women should not vote. He evaded a question as to the position of Hindoo women in their homes and their treatment by their husbands. It may be that he does not know much about it. He is not a married man. Priests of his caste do not marry. He mentioned two things which he said had impressed him in America. One was the absence of poverty in the country at large, and the other was the unusual prevalence of ignorance in the South. There is an American institution which we do not have to any extent in India. I like it very much. A lady was just coming off the elevator. She was somewhat startled by the red and yellow costume of the priest, but his imperturbable countenance gave no sign of consciousness of the attention he attracted. His address tomorrow night at the Lyceum will be mainly introductory of himself and explanatory of the Hindoo nation. He will speak briefly, but will remain in Baltimore and speak more at length a week from tomorrow night.